Julia Roberts' House from "Sleeping with the Enemy"
I’ve gotten a lot of requests to see the houses from the 1991 Julia Roberts movie Sleeping with the Enemy. Some people ask to see photos of the contemporary Cape Cod beach house, and others are more interested in the sweet post-Victorian house she hides out in when she flees to Iowa. It was built in 1905 and is bigger than it looks, with over 3,000 square feet. Kim Basinger was originally cast in the role of Laura Burney, but when she changed her mind, Julia Roberts took the part instead. Kevin Anderson played her neighbor and new love interest Ben, but I found him a little creepy. All that early-90s hair didn’t help, I guess. I like this scene where she messes up the hand towels in the bathroom, and it’s crazy how freaked out I get every time she sees someone has straightened them out again for her (cue the Psycho music). Who knew bathroom towels could be so scary? The kitchen looks totally different than it did in the movie. And the ceilings are huge! If anyone knows where they filmed the interiors for sure, let us know. I read that it was all shot in Abbeville somewhere. Could have been a temporary set, I guess, or inside a different house. The website SCIWay has more information about the filming locations and does mention that they built a separate bathroom set, but no mention of the rest of the rooms. For more photos and information about the house, check the listing by Patti Nickles for Prudential. OMG! Seriously? This is one of my favorite movies, ever! It’s fantastic to see this house again. What a treat, Julia! Ive always loved that house…..thanks for sharing. I never knew this was in Abbeville! (pronounced by locals as Abba-vull) Its right down the road from me. I may have to do a little architectural tourism next weekend! Oh my – I guess I have to move to South Carolina! Though I agree, the real interior is not nearly as cute as in the movie. Can’t wait to see the beach house! Thanks for helping me indulge my house obsession(s)! Liked the movie, but what draws me into watching it again when it’s on TV is that cottage. Loved the charm and coziness. Too bad the real one doesn’t look the same inside. But the exterior and the front porch are amazing. Wonder if there really is an apple tree nearby? Carol – the apple tree was my first thought too! This is one of my favorite movie houses – thanks for sharing! Love the exterior the most. Can’t you imagine sitting on the porch, sipping iced tea and waving at the neighbors? WOW, I’m looking for a house within that budget range. Too bad it’s so far away from home (Argentina), I love the house and I think it has wonderful potential and would make my family very happy. I love that movie. I’m not sure why because it is so scary. My husband refuses to watch with me. 🙂 The Cedar Rapids scenes are so cute. I sort of wish I could live in a town like the one they portray. Neat house but it needs updating inside. Sleeping with the Enemy was based on a book written by an author from Cedar Falls, IA and the house described in the book is an actual house in Cedar Falls. I went to college in Cedar Falls and remember her having a book signing while I was there. I could never watch this movie without my suspension of disbelief crashing to a stop at the notion of a woman with no presentable credit history or references somehow magically being able to rent a great big Victorian house, fully furnished with antiques and decorated to Laura Ashley perfection, on a small-town library clerk’s meager pay. I wondered about that, too. Hard to get a job without a driver’s license, SS#, or any proof of ID. She did take a bag full of cash with her, though, that she had stashed away. Maybe paying cash upfront was enough to rent the house? I was under the impression that the beach house actually exists on Figure Eight Island, Wrightsville Beach, NC. And I’m thinking the college scenes were filmed at Presbyterian College, Clinton, SC, fairly close to Abbeville. Could be wrong on both counts, though! Very scary movie…I’m with the posters on the “canned soup” scene and the current decor of the cottage! I read on the IMDb.com website that the beach house was a temporary building constructed at Wrightstville Beach that was torn down after filming ended. Have you seen photos of it somewhere? If it’s still standing, I’d like to track it down! I think your info is right! It was a temporary 3000 ft structure built on Shell Islanta then demolished. Movie Mondays are my favorite, and I can’t wait to till next Monday. Some of my best friends live just down the beach, but I need to quit typing or I’ll be a spoiler alert. Loved that movie actually one of my favorites with her, I suppose I like suspense! I loved the beach house, I laughed when you mentioned the towel scenes. Always check for extreme OCD in a partner. Lesson learned! Julia, the beach house was a temporary building that was torn down after filming. However it was not on Wrightsville beach, it was on Figure Eight Island. That is the private island just to the north of Wrightsville beach. You can practically swim between the two islands at low tide. Ah yes, I remember this house – what a great place for an escape! My friend live a house exactly like that one here in Conyers, GA. Amazing. Wow … so charming. And I’m with you, I’d have to be hanging a porch swing out there!! I wonder what it was that Julia disliked so about the town? wonderful house! one of my favourite too; though i prefer the inside in the film than in real life. Thank you for that tour! haven’t seen that movie in ages! Loved this house. the contemporary one, not so much. Love front porches like this one! I prefer by much the movie interiors. Would love to recreate that in this house, but where are the stairs? Good price too. The one thing I HATE about Julia Roberts movies is when they always make a scene so she can laugh that huge laugh that shows her full open mouth, which I don’t find attractive. What exactly didn’t she like about the town? I don’t know why they didn’t take a photo of the stairs. I’d love to see them! I looked up the listing for the house on another site because I was curious about that, too. Apparently in the real house, the upstairs is just attic space, so maybe there aren’t any stairs (yet)? I got curious about this and did some goggling. I found the article below where (on page 2 and 3) Julia Roberts describes what she experienced in this town that lead her to make those comments. I never heard her explanation for those statements. Very interesting–thanks, Lisa!! It would be fun to “freshen” up the interiors and keep the same vintage feel. What a great porch. I loved the “little” house in that movie! 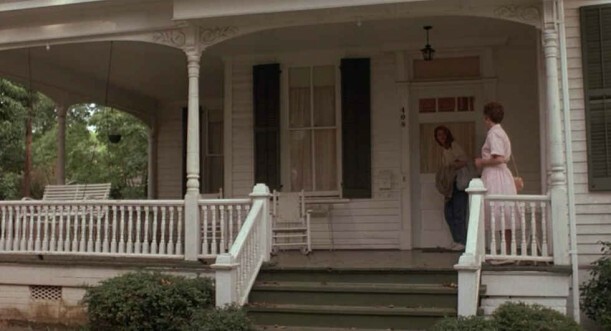 The scenes where she’s just hanging out on the porch always looked like perfection. Who knew towels and/or canned goods could be so scary?! I love the interior of the movie house much better. Too bad the real house doesn’t look the same. I love the exterior of the house, especially that porch. I would love to be able to sit on a porch like that and enjoy the outdoors. Thankyou for sharing this with us Julia! thank you julia…i love and look forward to movie mondays!! This is a house I have dreamed of . . . I would love to have it! I can just imagine sitting on that porch on a warm summer night. Love this house (the real and the imagined), but I would HAVE to install a swinging bench on the front porch. I’m with you on Julia’s new love interest in this movie. There’s something cheesy/creepy about him. I just saw it again recently and the scene when they first meet (while she’s picking up fallen apples) is really odd and kind of unsettling. 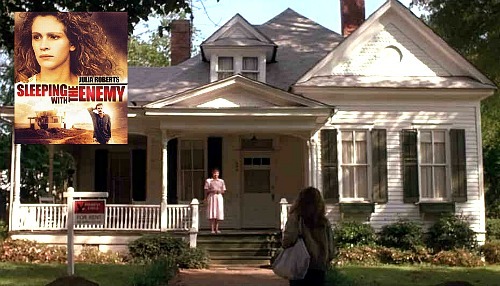 Hi Julia thank you for movie Monday well for us Tuesday – loved this house in the movie I didn’t like the beach house it looked creepy just like the hubby. I must confess I have only watched this movie once and promised myself never again too much cruelty. So thank you for reminding me how pretty her cottage was and like you I love the porch. Regards Esther from Sydney. I haven’t seen the movie, but now I want to. I love Julia, and I looooove that house! Inside of house from movie I love. Inside of real house, not so much. I would have to remodel it and redecorate and restore it to it’s original glory with modern conveniences of course. That was pretty interesting about Julia Roberts’ reaction to living in those Southern towns. I think it WOULD be hard for certain people to “fit in” there, esp. a Northeastern liberal. You wouldn’t have to say anything, to be “branded” negatively with stereotypes; just look what happened to Sen. John Kerry. 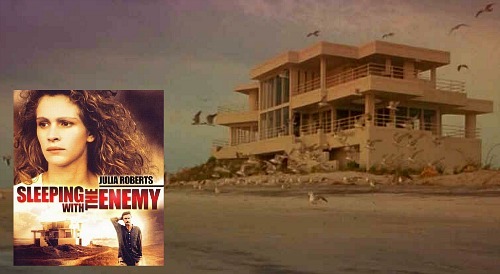 “Sleeping With the Enemy” was not my favorite Roberts film. Actually, I like her when she plays against type (aka her usual demure nice girl or “damsel in distress”), in such films as “Erin Brokovich”. She was great as the investigator in “The Pelican Brief”. About the houses, I do love that Edwardian home in Iowa and agree with several others that it looks much better in the film. Those antiques were gorgeous! As for the glass and steel house on Cape Cod, the idea of anybody being allowed (now matter HOW much money they had) to build something like that, right on what is obviously the Cape Cod National Seashore…is just ridiculous. You can’t even put up a pup tent there! And few New Englanders would even consider such a modern, cold, garish place, not only due to aesthetics, but also trying to stay warm it–even during summer! Not sure that its true, but I went to school in Wilmington, NC and always heard that the main house was on figure 8 island. I was told you could see it from the end of Wrightsville beach at the Shell Island resort. I couldn’t understand why when she uncovered the furniture, she shook the sheets over the furniture in the house instead of taking them outdoors. That just put the dust back on the furniture. By the way. My daughter worked with Julia Robert’s brother-in-law and she isn’t well liked by the family. When they all met for dinner, she didn’t offer to pick up the bill. This is one of my favorite movies. I always wondered how she managed to save up all that cash she had stashed away, enough to pay the rent and down payment on the rental house. Must have been several hundred dollar bills in that wad. It’s a lovely home, thanks for posting. I love this website! other houses I would love for you to put on would be the house from the movie Unfaithful, as well as the house that Ashley Judd lives in in the movie Kiss the Girls as well as the house from Sixteen Candles was great also! I really love this site!!! Wow i love this kind house if there were only in singapore..hehehehe. I SOOOOO wished i lived on that street !!!! Love the movie, and the house she moves into when she is cleaning & painting , it makes me want to clean !!LOL!! I like it better before. But i think it’s a sweet house still . Now i want to move !!!! If you bought a house up here in VT it would be soooo much more $ . So glad you put this on your site Julia !! =D Great job as always !!! It took a whole town to collect money to put an ad in Variety?… For four words? They could have kept that to themsevles or just be greatful that she put their town on the map. Too bad they re-modeled the cottage house. I loved the house as it was. The older look was the charm about it. Now it just looks modern. By the way, I love your website Julia. This is great! 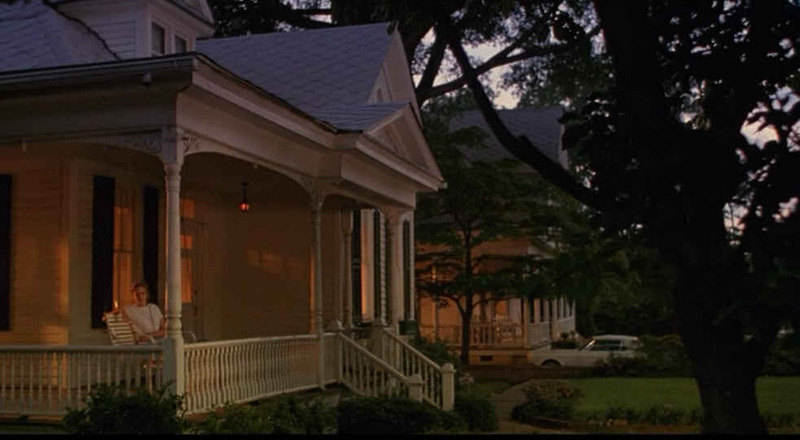 I am interested to know about the house in the movie Imitation of Life starring Lana Turner. I have always liked that style and wonder if it is a movie set or real house. Fab post! Totally agree with your comments about Ben. His breathy voice was what creeped me out (and his over eagerness). Possibly others picked up on this as I never saw him in anything else.There are many “as if” moments in this film (as if: that night there was a freak storm, that she was able to rent a house that size, that there happened to be a nice (albeit creepy) guy willing to protect her right next door, and that no one would have recognised she was a chick in drag!). Despite all that, still one of my fav 90s films. well hi this is maria again , I went to abbeville south carolina so the house its just like the movie only one thing not the same no swing out side anymore.. I took pictures love the house ,,, so southren charming; but dont understand one thing is” they try to make you beleave its in cedar rapids ‘ Iowa,, the house is in abbeville sc. and the town with a fountain was in town square in abbeville and they want you to think your in Iowa ,, why do they do that , film people I will never understand that” they said they put the sign saying welcome to Iowa when really she was in sc. they said they had to tell all the people in sc. dont where anything that says sc. remember were surpose to be in Iowa.. not sc. they go threw so much and money” doesn’t make sense.. and the person that wrote how did she come up with money to rent house , well she must have been putting money away for long time without him knowing so she could leave one day.. that would not be hard to do”’oh a the woman that said it would be hard for her to be in the south ; in real life” julia roberts was born and raised in Georgia’ she is southren in real life.. not from hollywood ca. I have always loved this house in the movie!! Since I was a child, I’ve wanted to live in a cozy house like this! Oh Wow! I was just perusing the internet for shots from this movie and came across this webpage. However did you get these great images from the film. P.S.- It bothers me that realtors, especially those I’ve seen on tv, keep encouraging people to ‘upgrade’ their homes for selling, to the point of stripping out any and all older fixtures, woodwork, etc, leaving them devoid of any character. I for one look for stuff like that, and it’s a real shame it’s all disappearing. I’d prefer a home be left as is so if there’s any ‘upgrading’ to be done, I can do it the way I want it, in the style and colors I want. 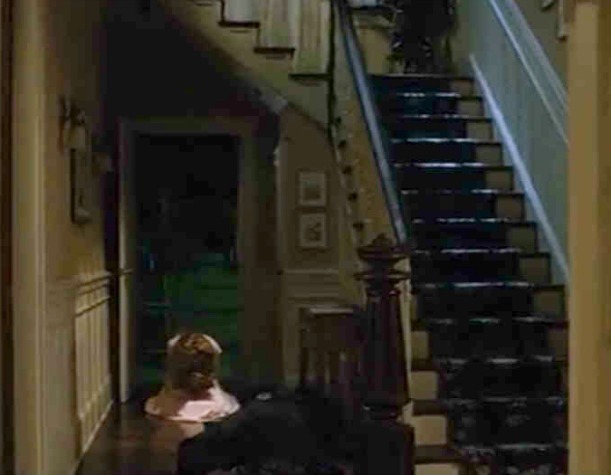 Personally, if the house looked like the interiors in the film, I’d leave it exactly like that. Oh, and I found the guy Ben to be a bit creepy himself too. Another movie house I really liked was the one in Practical Magic, the big old Victorian. Great house and property setting. Thank you SO much for this little blog; since re-watching this movie on Netflix recently, I have been thinking of how beautiful that “little Iowa cottage” was – perfect Americana. It’s nice to see that someone else felt the same way. How I wish I could live in something so sweet. Hi! Thank you so much for this terrific site you share, Julia! I’ve seen SWTE about 25 times (last nite & again a few minutes ago). I grit my teeth through the first part until I can relax when Sarah’s on the bus out of town. Martin is a psycho and her new friend, Ben has his own “issues”. He’s got this stalker behavior & penetrating eye contact. But, I digress. LOVE the house Sarah rents in “Cedar Falls”. I’ve lived in GA for many years and you can’t miss that the location is in the South. Thanks for sharing all about the cottage! Love all the vintage touches, including the sweet kitchen, claw foot tub, porch swing, “safe” town.